The 3/4" scale TOM THUMB at Yankee Shop, Danvers MA in the 1950s. Joe Friend gives a ride to an unidentified passenger. The original (1940s) 3/4" scale, 3-1/2" gauge TOM THUMB. Weight 40 pounds. Building time 6 to 12 months, per the old "Yankee Shop" catalogs. Photo courtesy of Bill Esther. The 1940s are back! Here is a classic from the earliest days of Yankee Shop. Coal fired, vertical boiler. A 2-cylinder marine-style style engine powers a crankshaft, and drive to both axles is via gear reduction and a chain drive. Strong enough to pull one adult on a level track. Ideal first-time steamer on which to learn your machining skills. Perfect for that small backyard loop, or "up and down" line in your side yard. This is a fine engine for a beginner. It does not take too long to build and is not expensive, has been built by several sons and wives. The newer re-designed loco will haul a man and a boy well on a reasonably level track. Minimum tools required, yet a good skill sharpener. An updated version of TOM THUMB is currently running in LIVE STEAM & OUTDOOR RAILROADING magazine. It remains true to the original in most respects, but has some modern improvements to make it a better steamer, a stronger hauler, and with improved coal and water-carrying capacity. It uses some castings from the original design, the first of which Friends produced were the wheels. They are available below; please scroll down. Thank you for your interest! The construction series for "The New Tom Thumb" is currently (2013/2014) running in LIVE STEAM & OUTDOOR RAILROADING magazine. If you'd like to see Lester Friend's original (1941) TOM THUMB drawings for reference and comparison purposes, or so that you might "follow your own mind" (one of Lester's favorite sayings) when building your "New Tom Thumb", they are available below. There are 3 sheets total. Please click the Paypal link at right for your original (1941) Tom Thumb drawings to be shipped to the USA. For other countries, please inquire. 3" diameter, cast iron, the same wheels as specified for the original Tom Thumb of the 1940s. Order 4 wheels for your locomotive, and if you wish you may order 4 additional wheels for use on the "new" Tom Thumb's tender. You may also order spare wheels in case of machining mistakes. Purchase links for USA and Canadian shipping are listed below. For other countries, please inquire. Tom Thumb wheels. Order 4 wheels for your Tom Thumb locomotive; order 8 wheels for your locomotive and tender. 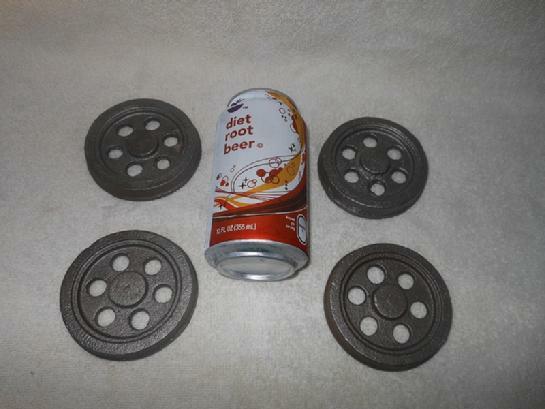 Identical to Lester Friend's original 1941-era wheel castings, and compatible with the "Improved Tom Thumb" in LIVE STEAM & OUTDOOR RAILROADING magazine. USA shipping: Please click the Paypal button at right to order your Tom Thumb wheels to be shipped to the USA. Price $25 each; order any quantity you choose. The locomotive requires 4 wheels (enter a purchase quantity of "4" ); and the tender requires 4 additional wheels (enter a purchase quantity of "8"). Canadian shipping: Please click the Paypal button at left to order your Tom Thumb wheels to be shipped to Canada. Price $25 each; order any quantity you choose. 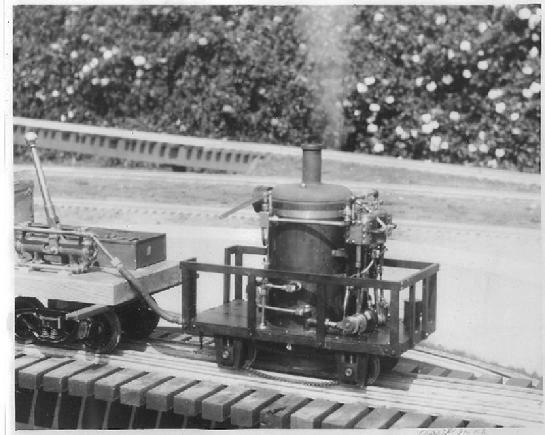 The locomotive requires 4 wheels (enter a purchase quantity of "4" ); and the tender requires 4 additional wheels (enter a purchase quantity of "8").